21But Jesus was talking about his body as a temple. 22And when he was raised from death, his disciples remembered what he had told them. Then they believed the Scriptures and the words of Jesus. 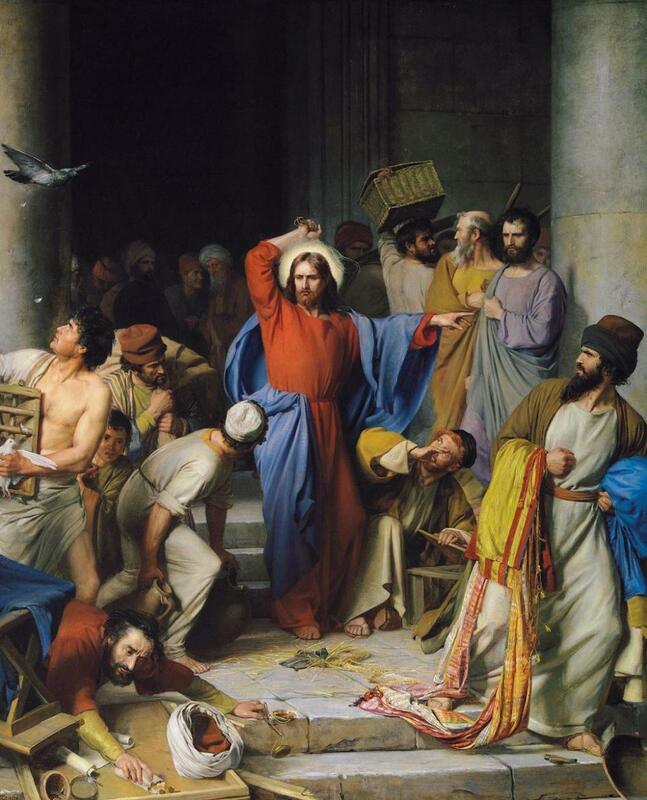 Now Jesus is doing something, now he’s showing them who’s boss… Bring on the revolution! I love this picture for the mayhem it shows as tables are turned over. What mayhem Jesus can bring when he starts his work! “They” had assumed that when the Messiah came, he would make the Temple even more glorious (Tom Wright p 59), but what Jesus starts by doing is cleansing it – getting rid of what had no place there. God’s new work was about far more than the Temple building. God is doing his new thing. Jesus is over-turning the abuses, the short-changing and the profiteering that is going on in the place that is meant to be holy – God’s house. He is angry that these things are happening and throws them out. Bravo for Jesus. But as we stand by and cheer, I am brought up short. I am left to think on what tables are there that need turning over in my life? What is there in me that is turning God’s holy space into no more than a market place? What is being short-changed in me? God has come to do a new thing is the recurring theme of Tom Wright’s book, it is the recurring theme of Jesus life – is it the recurring theme of my life?